MyHosting.com offers a 30 day money back guarantee on their VPS hosting plans. This means you can try the service for a full month before deciding whether or not you want to pay for it. 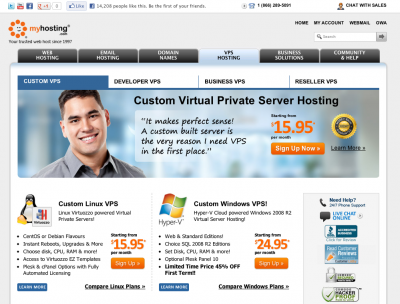 MyHosting.com offers both Linux and Windows based VPS plans. All plans also come with $75 in Google AdWords and Bing & Yahoo search credits. *All pricing is listed based on a one year term. Monthly pricing may increase or decreased based on selected term. Not sure whether you need a Windows VPS or a Linux VPS? While Linux VPS systems are more cost effective, they do not support any Microsoft proprietary technology such as: MS Access, ASP, or MS SQL. If your site is built using PHP, Perl, or MySQL, a Linux based server will suffice. However, for those who need a more user-friendly setup, Windows VPS is the way to go. Their setup uses a GUI, or graphical user interface, whereas a Linux based system will use only text commands. Whether your small business needs Linux or Windows based hosting, MyHosting.com has a plan to suite your needs. If you have different requirements, you can make adjustments to your plan for additional monthly fees. You can opt for various upgrades on Plesk or cPanel, and uou can purchase additional: IP addresses, vCPUs, RAM, disk space, and bandwidth as needed to create a truly customized hosting solution.